Language Hat recently had an entry on the Russian name for the raccoon (Procyon lotor), енот, which attracted some comment about the word for ‘raccoon’ in different languages. Although I made a few comments at that thread, it seems interesting to draw information together from the perspective of ‘A Thousand Miles of Moonlight’. 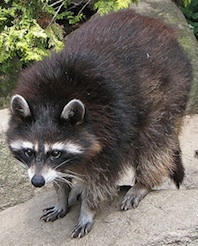 Prior to the settlement of the Americas, raccoons were unknown to Old World cultures. The languages falling within the ambit of this blog adopt three different strategies for naming the raccoon (although with some overlap): expressions meaning ‘wash-bear’, expressions meaning ‘raccoon dog’, and expressions meaning ‘panda’ respectively. (Animal photos are all from Wikipedia). Although the raccoon isn’t actually a bear, there is an existing international tradition of naming the raccoon a ‘wash-bear’. This is based on ‘its characteristic dousing behavior’ in conjunction with each language’s term for "bear", for example Waschbär in German, orsetto lavatore in Italian’ (Wikipedia) etc. Chinese and Japanese both follow this tradition. In Chinese (Mandarin) the raccoon is known as huàn-xióng (浣熊), meaning ‘wash bear’. This name is mainly interesting for the use of huàn (浣), a literary word for ‘wash’ or ‘rinse’. Since 浣 is a rarely encountered character, the name for the raccoon is (according to Wikipedia) often mistakenly read as wǎn-xióng. However, Chinese popular usage refuses to be pinned down by official or ‘correct’ usage. In the Chinese pet trade the raccoon is apparently known as límāo (狸猫, Trad 狸貓), more normally understood to refer to the leopard cat (Prionailurus bengalensis). Since it would be possible to write an entire thesis about this name and its background, I will pass over this for the moment. The Japanese name for the raccoon is arai-guma (アライグマ), meaning ‘washing-bear’. While katakana is now standard for animal names in Japanese, they can also be written in Chinese characters, in which case arai-guma is written 洗熊 (arau 洗う = ‘to wash’, kuma 熊 = ‘bear’). Arai-guma can also be written using the Chinese written form (浣熊), giving rise to another of those quirky character usages that the Japanese so delight in. The use of these characters to write the name suggests some Chinese influence in the Japanese naming, although the direction of influence in such cases is often moot. Another approach is to name the raccoon after the locally occurring raccoon dog (Nyctereutes procyonoides), a superficially similar but unrelated species of animal. For example, Korean uses the name migungneoguri (미국너구리) ‘American raccoon-dog’ or amerikaneoguri (아메리카너구리) ‘American raccoon-dog’ for the raccoon. The words migug (미국) and amerika (아메리카) are both terms for America (more specifically the United States); neoguri (너구리) is the name of the raccoon dog. Additionally, the Koreans have also borrowed the Chinese name 浣熊, read wanung (완웅) in Korean, but this appears to be quite uncommon. Wikipedia also gives gaegom (개곰), ‘dog-bear’, as the North Korean name. The Mongolian name for the raccoon is elbenkh (элбэнх), occasionally seen as ilbenkh (илбэнх), which is traditionally the name of the native raccoon dog. This leads to issues of differentiation which don’t appear to have been satisfactorily resolved. 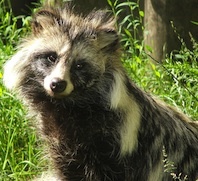 Zoological reference books on native species call the raccoon dog nokhoi elbenkh (нохой элбэнх) ‘dog elbenkh’, with an alternative being zagal elbinkh (загал элбинх) ‘zagal elbenkh’. Zagal (загал) refers to one of those enigmatic Mongolian livestock colours, apparently a kind of white colour with brown on the face. Needless to say, even taxonomic reference books easily slip into unmodified elbenkh (элбэнх) when discussing the raccoon dog. One Mongolian-Chinese dictionary even manages to reverse the usage, giving the name elbenkh (элбэнх) to the raccoon dog and nokhoi elbenkh (нохой элбэнх) ‘dog elbenkh’ to the raccoon. A third tradition names the raccoon after the panda. In Inner Mongolian usage (at least according to dictionaries), the raccoon is known as ukhialch maluur ötög (ухиалч малуур өтөг) ‘washing panda’. This name is not current in the country of Mongolia. Ukhialch (Ухиалч) is based on the Mongolian word for ‘ablution’, plus the suffix ch meaning ‘one who does something’. Since the normal Mongolian word for ‘to wash’ is ugaakh (угаах), the use of a less common term is reminiscent of Chinese huàn (浣), suggesting that the name may have been influenced by Chinese. The word for ‘panda’ is made up maluur (малуур) and ötög (өтөг), both of which call for some explanation. Maluur (малуур) is an alternative form of manuul (мануул). The meaning is ‘wild cat’, although the type of animal referred to differs between northern and southern Mongolian-speaking lands. 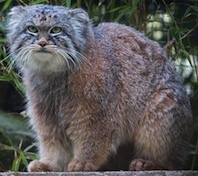 In Mongolia, manuul (мануул) is the name of a a wild feline known in English as the Pallas’ cat or manul (Felis manul). Dictionaries of Buryat -- a dialect of Mongolian that has been standardised as a separate language in Russia -- also define maluur (малуур) as referring to the Pallas’ cat. Inner Mongolian dictionaries, on the other hand, list maluur (малуур) as meaning ‘wild cat’, specifically our friend ‘leopard cat’ (Prionailurus bengalensis). Ötög (өтөг) is an older Mongolian word for ‘bear’. It is unfamiliar to most Mongolians as it has largely been supplanted by baavgai (баавгай) in the modern language, or baabgai (баабгай) in Buryat. Together, maluur ötög (малуур өтөг) literally means ‘wild-cat bear’. This name is probably modelled on the original Chinese name for the panda, māoxióng (猫熊 Trad 貓熊) ‘cat bear’, which is still used in Taiwan. In China, however, the order has been reversed to xióngmāo (熊猫 Trad 熊貓) ‘bear cat’, which is now the more familiar Chinese name for the panda. Vietnamese is another language that names the raccoon after the panda. 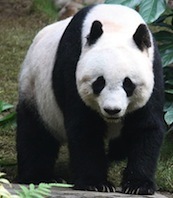 The usual names given in dictionaries are gấu trúc Mỹ ‘American bamboo bear’ or gấu trúc Bắc Mỹ ‘North American bamboo bear’, where gấu trúc ‘bamboo bear’ is a Vietnamese name for the panda. There is also an alternative name, gấu mèo Mỹ ‘American cat bear’, which uses the other Vietnamese name for the panda, gấu mèo ‘cat bear’. To name the raccoon after the panda is at first glance quite peculiar. What could have motivated anyone to compare the raccoon to a panda? 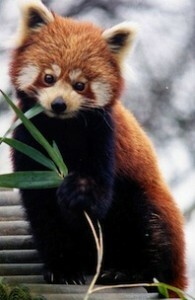 In fact, while the name ‘panda’ now more usually refers to the giant panda (Ailuropoda melanoleuca), another very different-looking panda also exists: the lesser panda (Ailurus fulgens, aka the red panda). Since the raccoon bears an uncanny resemblance to the tree-climbing lesser panda, it is tempting to speculate that the lesser panda, rather than the lumbering giant panda, was the model of the Vietnamese and the Inner Mongolian names. Unfortunately, neither type of panda is found in Vietnam or Inner Mongolia, lending little support to the idea that the name was based on a similar appearance. Moreover, while the name ‘panda’ in English was originally used for the lesser panda and only later extended to the giant panda, in Chinese it was the other way round: the giant panda was named first and the lesser panda was named after it. Both the (Inner) Mongolian and Vietnamese names (especially gấu mèo ‘cat bear’, a calque on the Chinese name), also primarily refer to the giant panda. The possibility that the Inner Mongolians and Vietnamese spontaneously named the raccoon after the lesser panda appears very slim. A more likely motivation for the naming lies in taxonomy. The taxonomy of both types of panda has been the subject of interminable debate, with conflicting arguments that the giant panda belongs with the raccoons, with the bears, or in a separate group of its own (including arguments that the two types of panda themselves are not closely related). It is thus quite possible that the raccoon was dubbed a kind of panda at a time when the raccoon-affiliation theory was dominant. Very interesting. I love these cross-linguistic labyrinths of fauna&flora words. For more confusion, English translations often call tanuki “badgers” or “racoons” and only rarely “racoon-dog” (and I think the latter is what is typically intended, with the caveats you noted in the other thread). So Mustelidæ, Procyon lotor andNyctereutes procyonoides all become confused unless one takes the time to investigate. Pointless trivia—famous videogame character Mario could acquire a tanuki suit in Super Mario Bros. 3; what’s interesting is that “tanuki” was not translated, but simply got an anglicized spelling as “Tanooki”. What was in the original a “tail Mario” was translated as “racoon”, which makes sense given its flat, stripped tail; so that Super Mario 3 from 1988 actually distinguished racoons from tanuki. also, we need to take care to distinguish raccoon dogs with a dogs for the hunting of racoons! Leonard, I haven’t got up the courage to tackle the tanuki head on just yet. I think it’s rather complex historically and there are lots of question marks. There is a great page on tanuki at Tanuki in Japanese Artwork. That’s a good page, I’ll take the time to read it. Undoubtedly popular names, folklore, and linguistic variation (geographical and historical) all present significant complications to biological vocabulary. On the folklore side, Blacker’sThe Catalpa Bow is disappointly sparse on tanuki; but she advances a thesis from Yanagita Kunio that a variety of dogs and foxes are all fundamentally the same folkloric kitsune figurel; they’re invariably described as “long, thin, with reddish-brown fur, short legs and sharp claws”, and they can possess people, become invisible, and make contracts with evil people (fox-users, kitsunedzukai). The examples given are, as a dog: inugami in Shikoku and Chūgoku; izuna in Tōhoku, Aomori, Iwate; gedō in Hiroshima; and, as a fox, ninko 人狐 in Izumo; yako in Kyūshū; osaki in the Kantō area; and kuda in Shizuoka, Nagano, Yamanashi.